A death notice, also known as a funeral announcement, a death announcement, or a funeral invitation, is commonly sent to friends and family to announce the death of a loved one. Historically, making a death notice has required that a payment be made to a newspaper or publication of choice, somewhat akin to a classified advertisement. But today, with the proliferation of the internet and internet-connected devices, many individuals are turning to sharing a death notice online, whether it be on social media sites like Facebook, via text, or simply via email. You can send a death notice or funeral announcement via email to an entire community on Ever Loved. To start, simply create a memorial website for a loved one, with information such as the loved one’s profile image, name, date of birth, date of death, and funeral event details. From there, visit the tab in the header called “Send email,” add the emails of the people you’d like to announce a death to, and click the Send button. Your email recipients will then receive a simple yet elegant notice via email. The email looks great when viewed either on a computer or a mobile phone, especially important since many people today check their emails on their smartphones. 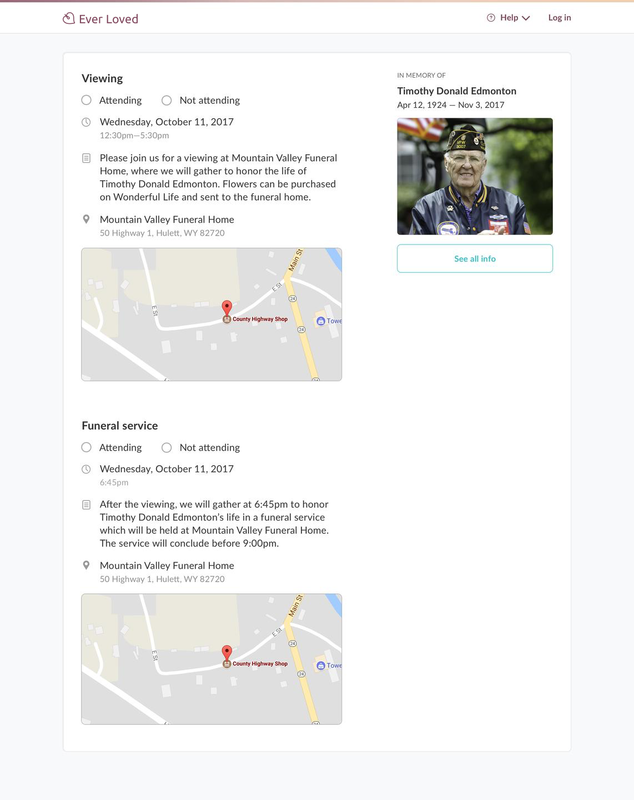 When someone decides to click the button that says “RSVP,” they will be directed to your loved one’s memorial website where they can learn more about the funeral events and even RSVP. Once you start to receive RSVPs, you can track who is attending and who isn’t by visiting your “RSVPs” page. It’s useful to know who is coming and who isn’t because it allows you to be more prepared for any upcoming funeral events by knowing the guest list and count for each event. Interested in sending a funeral announcement online on Ever Loved? Simply create a free memorial website for your loved one to get started. Use the “Send email” tool to help you make the death announcement with ease via email and use the “RSVPs” tool to help you better manage your guest list.